Two new developments, of very different kinds, are on the horizon for glaucoma patients, reports Radhika Holmstrom. Around one in 50 people over 40 in the UK is estimated to have glaucoma; and if the condition is caught early enough, it’s entirely treatable. The main campaigns, therefore, are usually urging the surprisingly large number of people who do not have regular eye checks to get themselves to the optician as soon as possible – ideally at the stage when their vision isn’t yet perceptibly affected. “Because glaucoma happens to an ageing population, the number of patients we see continues to expand. At Moorfields there has been a 15 per cent increase between 2009 and 2012. That is an increasing pressure. Often patients’ appointments may be rescheduled, and quite a number will miss an appointment too,” says John Brookes, consultant ophthalmologist and glaucoma specialist at Moorfields Hospital, London. “In the early stages patients don’t feel that there is anything wrong with them. We’ve also found that many of the patients who miss appointments are fairly vulnerable people, who wouldn’t re-contact the hospital by themselves,” he adds. This has been the case for some time. In fact between 2005 and May 2009, the NHS’s National Reporting and Learning Service received reports of 44 glaucoma patients whose sight deteriorated – including 13 who went blind in one or both eyes – as the result of delayed follow-up appointments. The results, based on work with Brookes as well as consultants from Manchester Royal Eye Hospital and Royal Hallamshire Hospital, Sheffield, have formed a submission to NICE on how to improve practice. There are two key points. One is to make sure clinic clerks have a basic understanding of glaucoma, and the importance of getting prompt appointments even if the patients’ sight does not seem to be changing. The other is to ensure that patients themselves know when they should be seen and what to do about cancelled or delayed appointments (and in addition, patients may benefit from learning how to monitor their own intraocular pressure). There’s also a good chance that the treatments themselves may change in future, as new research generates new evidence about the way the disease operates. In particular, Harminder Dua, professor of ophthalmology and visual sciences at the University of Nottingham, has discovered a new and distinct layer deep in the tissue of the cornea which may impact on the understanding of glaucoma. ‘Dua’s layer’ is made up of thin plates of collagen and sits at the back of the cornea; and recently Dua and his colleagues have demonstrated that this layer also continues at the periphery as part of the trabecular meshwork. The fibres of the newly identified layer branch out to form the meshwork, and the cells of the trabecular meshwork populate the new layer for about half a millimetre into the periphery of the cornea. It looks as if the trabecular meshwork begins to form in the corneal periphery at a much earlier point than was previously thought. 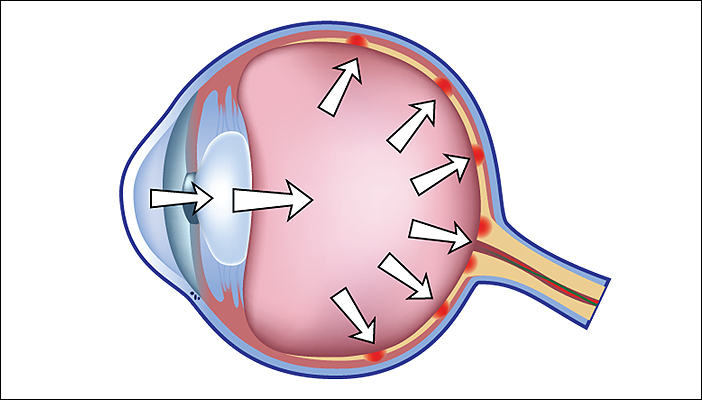 For glaucoma, that has particular implications for the significant number of people who have surgery – but also for thinking about how the condition operates more generally. “Identifying these different types of tissues will change our thinking on the meshwork and on how the cornea could contribute to the stresses and strains which the meshwork experiences,” Dua explains. “Every heartbeat, every blink, puts stress on the cornea and this is likely to be passed on to the trabecular meshwork. Given the significance of the meshwork in glaucoma, it’s possible that such stresses and strains will come into the thinking about glaucoma, and will also explain partly why so many people with a corneal transplant develop glaucoma. The term glaucoma covers a number of different eye conditions in which the optic nerve is damaged at the point where it leaves the eye. Often – although not always – at least part of this damage is caused by an increase in ‘eye pressure’, either because the eye has produced too much aqueous fluid or because it cannot drain away this fluid properly through the trabecular meshwork, a wedge-shaped ‘sieve’ made of beams of collagen, through which the aqueous fluid of the eye drains out. Acute angle closure – or ‘acute’ glaucoma – comes on very differently, because it’s caused by a sudden sharp increase in pressure and is often very painful. Most people need laser treatment and/or surgery in addition to drug treatment – and to need it in both eyes, as there is a high risk the other eye will develop the same problem; but on the other hand this often makes it possible to restore almost complete vision, because the optic nerve has not been subjected to long-term damage. By 2013 over 90 per cent of patients at the Manchester Royal Eye Hospital were receiving their outpatient appointments at the appropriate review interval. Cecilia Fenerty, consultant ophthalmologist at Manchester Royal Eye Hospital, who worked on the NICE submission, describes the way that the hospital now manages glaucoma patients. “The first challenge is to quantify the caseload, and that can be quite difficult because patients with glaucoma may be seeing other ophthalmic consultants, not just glaucoma specialists. After that, it’s all about stratifying the risk or severity of the disease so we could allocate patients appropriately. “Lower-risk patients start with the glaucoma evaluation clinic, a virtual clinic which is a one-stop-shop which leads to a personalised letter, where all the information has been reviewed by a consultant. We can inform them about the next step, whether that is no appointment, a follow-up appointment, or anything else. "A step up from that is the lower-risk patients who are treated in the assessment clinic, staffed by trained optometrists who all have or are working towards a diploma and are managed under consultant supervision. Then the step up from that is the higher risk patients with advanced glaucoma, who are seen within the consultant-led clinic. Further information on glaucoma can be found on the RNIB website or on the National Institute for Health and Care Excellence website and International Glaucoma Association (IGA). Human Corneal Anatomy Redefined — A Novel Pre-Descemet’s Layer (Dua’s Layer).